The Presidency is constrained to decry criticisms, mostly on social media, on the retention in London of the Presidential Aircraft, NAF 001 as mostly informed by lack of understanding of protocol around foreign trips by Heads of State all over the world. It is important to state that for reasons of protocol, national security, diplomacy and prestige, there is no world leader who travels abroad and is left without plans for immediate return or possible evacuation. From operational point of view, this country’s Armed Forces as represented by the Nigeria Air Force are not to abandon their Commander-In-Chief in whichever circumstance he is. This is a standard operating procedure. We have also read claims about outrageous fees allegedly paid by Nigeria. The published amounts are totally untrue. Aircraft conveying heads of state all over the world usually enjoy waivers even where payments for parking are differentiated by aircraft categories. We been assured that where the waiver is not granted, payment will not exceed £1,000, which is a quarter of the amount being peddled. 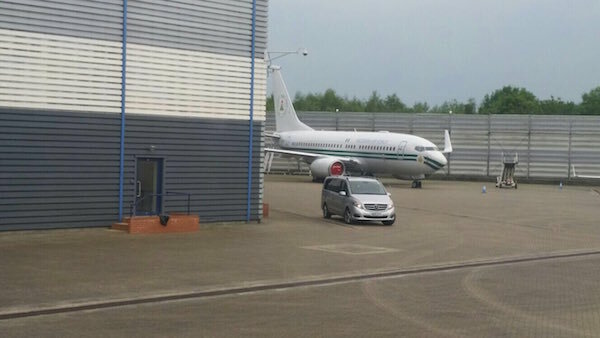 For the avoidance of doubt, this President is not the first to have a presidential aircraft standing by for him, as he will certainly not be the last. All past Heads of this country have had this privilege, and the part that surprises the most is that leaders who in the past travelled with three Nigerian aircraft did not suffer this trenchant criticism. We appeal to Nigerians to ignore opposition campaign aimed at derailing this administration’s big plans for the country. This is a government that is constructing the Second Niger Bridge, the Mambila Power Plant, the East-West and the North-South standard gauge railway lines. We are a government that has saved this country an annual loss of two trillion Naira from fraudulent petroleum subsidy schemes by influential citizens and their children, and rid the public service of about 50,000 ghost workers. The Buhari administration certainly deserves a chance. Abeg Shehu go and sit downyoi just want to justify your salary ….